This is the season where many bloggers are providing their predictions for the year ahead. I tend to opt out of these because a year is both too long and too short to foresee many types of change, which are like rainstorms or earthquakes: you know one's coming, but you don't know quite when or where until the early warning signs appear. I'm more of a Long Bets man, so today I'm going to revisit something I've touched on occasionally in the past, most recently nearly two years ago: the falling price of MP3 players and the possible implications for listening/buying experiences. 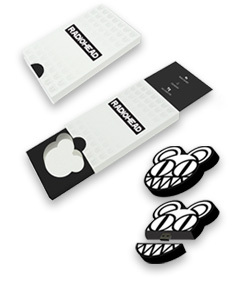 In the last year or so there's been a growing wave of music being distributed on USB sticks — the picture is of Radiohead's 6-album "boxed set" in its USB version, which, at $160 or £79.99, somehow cost twice as much as the CD version of the same albums. The problem with these products is that, once you've copied the data off the stick, the stick is just… a stick. You can keep it on a shelf, back-up your homework or your novel on it, forget about it in the glove compartment or loan it to a friend who forgets it in his glove compartment. It's a piece of plastic with some data on it. But add a player to it, and it has a different kind of value. Now you just have to bring your own headphones (or powered speakers) and you've got all you need to keep you entertained for as long as six Radiohead albums turn you on (about 15 minutes in my case, but these people may differ). 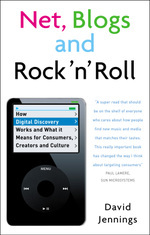 Continue reading "The Age of the Free MP3 Player"
I'm looking for examples of organisations (or looser affiliations of individuals) who are using social software for professional development. Does anyone have any suggestions that I could follow up? By social software I mean social networks (e.g. Facebook, Ning), blogs, wikis, shared bookmarks etc. And professional development can mean many things, but I'm mostly interesting in enhancing intrinsic job-specific skills on the one hand and broader scouting of collaborative/entrepreneurial opportunities on the other. The organisations could be membership-based, employers, educators or just self-organising networks. Any suggestions welcome, either via comments here, or private communication.